Tree Removal Services with Lusk Tree Services Inc.
TREE REMOVAL AND STUMP REMOVAL – SAFETY FIRST! We cut no corners when it comes to protecting our customers and employees. All of our employees are trained and fully insured. 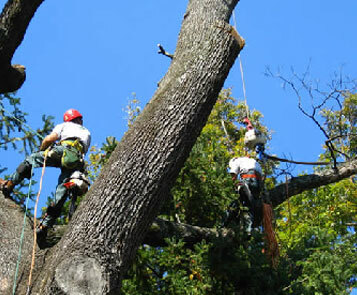 Our customers and their property are fully protected.Large tree removal requires a high level of skill and expertise. In these photos, crew leaders Derek Renegar and Tom Kelley carefully rig large limbs before they are lifted out by a crane Often it is necessary to remove dead, dying and/or hazardous trees. 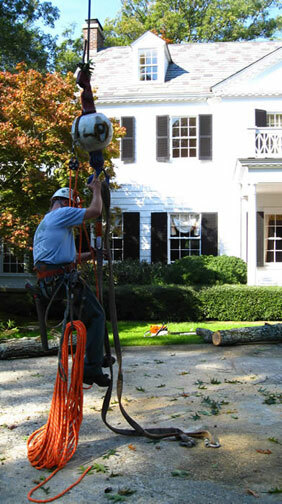 We offer complete tree and stump removal services. Insured with General Liability and Worker’s Compensation insurance through The Hartford, we will gladly provide certificates of insurance.CAUTION: Don’t take chances with an inadequately insured company or a company that uses a sub-contract labor force. Hiring workers as “sub-contractors” is a ploy that some companies use to avoid the legal requirement of protecting employees with Worker’s Compensation insurance while still providing a certificate of insurance. (This is also a shortcut to avoid paying withholding taxes). This exposes the homeowner to serious liabilities in the event of a work-related injury. Coming down from a hard day’s work. Locally owned, since 1979, our goal is customer satisfaction. For customer commentaries, click here.